One of the coolest results so far from the global change experiment I’ve been working on is that mosses that are part of the biological soil crusts have pretty much all died in response to the experimental addition of numerous small rainfall events (Reed et al. 2012). The mosses die because they lose more carbon during the small wet-up events than they can gain from photosynthesis during the short time that they are rehydrated. This finding got us curious about the moss physiology and biochemistry behind why they cannot keep up with the carbon demands and what ultimately causes their death. To help answer that question, my postdoc adviser Sasha Reed and I visited the University of Missouri last week where we learned some awesome analytical techniques in Mel Oliver’s lab, particularly from his amazingly skilled postdoc Abou Yobi. These guys are experts in plant biochemistry and we had a lot of great conversations about stress biology and the chromatography techniques (one of their cool HPLC units above) that they are using to measure the key metabolites that govern plant responses to stress. 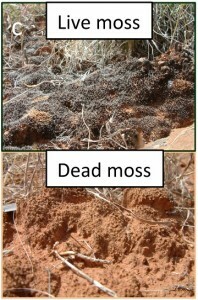 Many mosses, especially in the desert, are dessication-tolerant, meaning they can completely dehydrate and rehydrate as part of theyr normal physiological function. There is a ton of fascinating biochemistry here, particularly in understanding how the plant cells respond when they dry out and wet up. 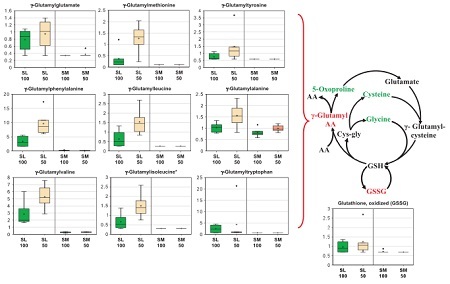 Plants have two strategies in surviving dessication: protection and repair. In practice, most dessication-tolerant plants are somewhere along this spectrum. They can try to protect their cells in preparation for dessication by resorbing and preserving themselves as best as possible, or they can devote resources to repairing cells and tissues once they rehydrate. There are a huge number of metabolites, proteins, enzymes, and other compounds that help these mosses perform the amazing feat of surviving total dessication and rehydration. There are compounds that help them resist the osmotic shock of drying out and rewetting–osmoprotectants–such as sucrose and some amino acids. One of the interesting facts we learned is that Syntrichia ruralis, a sister species to the one present in our experiment, S. caninervis, is 10% sucrose by weight when it is dried out. This is the first thing we want to look at in our mosses because if they cannot regenerate those sugars, they may not be able to dry out properly, sustaining damage to their membranes without the sugar to mediate the collapse of cell membranes and organelles. Other potentially important compounds include antioxidants, photoprotective pigments, and a class of proteins called LEA proteins that can prevent reactive oxygen species (ROS) from building up and damaging cells. 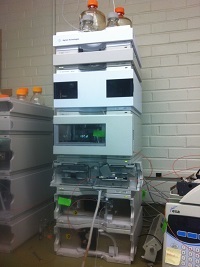 Mel and Abou have been using “omics” approaches in which a large number of metabolites (metabolomics), expressed genes (genomics), proteins (proteomics) or other compound classes are measured simultaneously to give a more complete biochemical picture of a plant tissue under conditions such as dessication (example figure above). Perhaps the ultimate way to answer our question would be to use these techniques on mosses over the course of the rapid wet-dry cycles that ultimately result in their death. We won’t go that far at least for now, but it was fascinating to learn what kind of analytical capability is out there. Bringing these types of approaches to global change experiments could be an excellent avenue for future research and collaboration!